The new dollar coins will be unveiled Monday, and they’re causing a bit of a stir. People are concerned that the motto “In God We Trust” has been relegated to the rim of the coin rather than on the obverse or reverse. Another concern is that we’ll be honoring Richard Nixon. My feeling is that if they were elected to be President of the United States, they deserve to have a coin. It would take a whole lot of those dollars to get most people to even consider running for President. Here’s an excerpt from an article in USA Today about the new dollar coins. 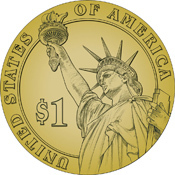 The US Mint web site has a whole section devoted to them, including the schedule of their release. WASHINGTON - Can George be successful where Sacagawea and Susan failed? The U.S. Mint on Monday is unveiling designs for its newest additions: dollar coins that will feature deceased presidents on a rotating basis, similar to the popular state quarters. 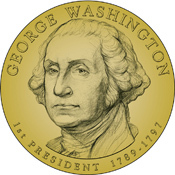 The coins will enter circulation with George Washington on Feb. 15, four days before President’s Day, and will be gold in color like the Sacagawea to distinguish them from other coins. Like the Sacagawea, they will be slightly larger than the quarter.